Do you need some emergency electrical repairs to be carried out at your office? And for which you are looking for a Northern Beaches electrician. Do you have some repairs that need to be attended to and for which you are looking for an electrical contractor in your locality? As part of the extensive electrical services work that Sequence Communications and Electrical engages in for both our domestic and commercial sector clients’, we believe that safety and quality is the very basis of the services that we offer. Our electrician in Northern Beaches engage in installing safety switchboards and switches, electrical system upgrades and rewires, replacement of old electrical systems and equipment and air conditioning installations, repairs and maintenance. Repairs or replacement, installations or upgrades, it is the trademark of the electricians in Northern Beaches of Sequence Communications and Electrical. With quality being our middle name and our electrical repairs and services being affordable, we are well-regarded for our work. 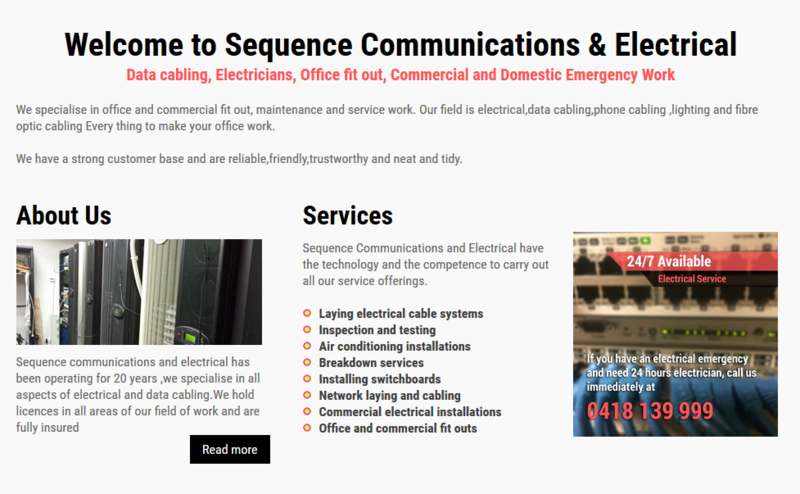 "If you want the affordable electrical service Northern Beaches of Sequence Communications and Electrical to undertake any planned domestic electrical services work at your residence, then you should contact us on 0418 139 999 or (02) 9913 9999 or you can email us at peter@sequence.net.au. "